If you’ve been following our concrete repair series, you’ll already have read up on how to identify and diagnose concrete failures as well as about the European standard to which concrete should be protected and repaired. In this post, we’ll look at some of the systems, techniques and products available to repair concrete that needs some TLC. Before applying any repair products, the area in question should be assessed and diagnosed according to BS EN 1504-9 to select the appropriate repair method. This may include removing the damaged concrete and any visible corrosion. A typical method to remove damaged concrete is grit blasting (see BS 7079 for the quality that needs to be achieved). We’ve broken down some of the more common types of repair materials to give you an overview of what’s out there and when it should be used. If the repair calls for a hand-applied system then you need to pre-dampen the substrate and apply a primer to the steel and concrete before packing the mortar into the space by hand, finish so that it’s flush with its surroundings and then leave it to cure. Hand applied repairs are usually polymer modified mortars for small repairs between 10-75mm in depth. A good example of this type of material is EUCO HB, a lightweight, high build and low shrinkage repair mortar that can be trowelled into place. 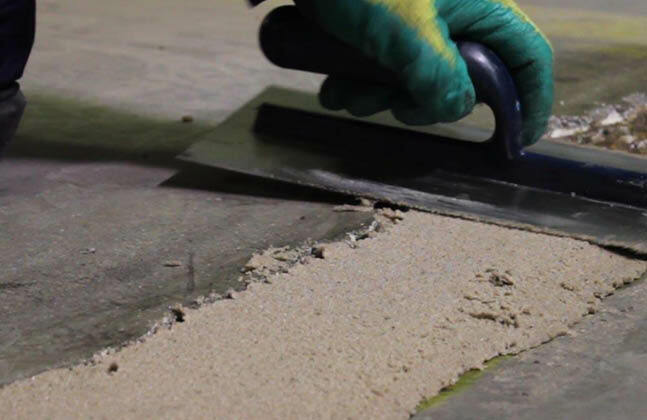 Fairing coats are applied to prepared surfaces at a typical thickness of 1-3mm to provide a fair faced finish to repaired concrete. Surfaces should be dampened before application and minor imperfections in the finish may be removed by applying a dry sponge finish. Cracks must be filled with a suitable acrylic crack filler to prevent loss of coating into the cracks. 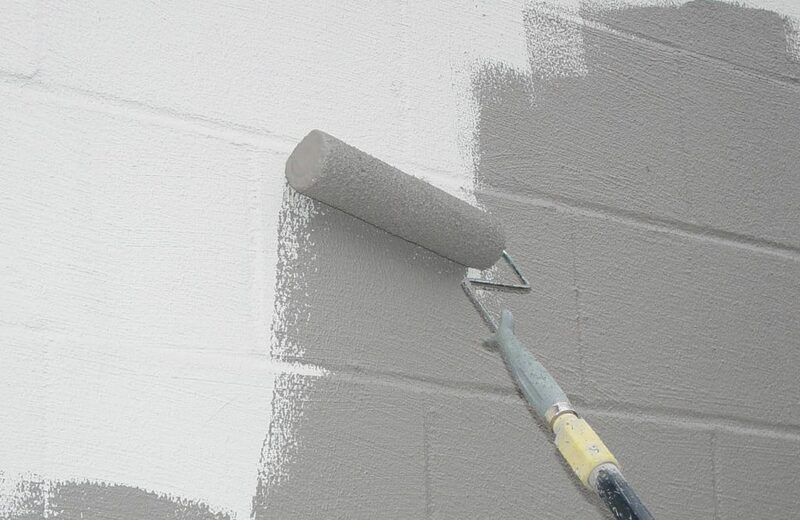 Depending on the chosen system, two or more coats of anti-carbonation coating should be applied by long nap roller or airless spray equipment. Attention must be paid to air humidity levels during application and during the drying period. If rain is forecast to arrive before the coating can become rain resistant then it must not be applied. 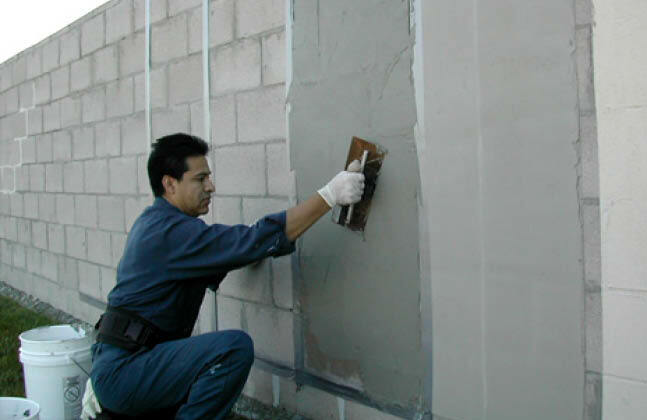 Tammscrete being applied to repair a concrete wall. Check out Tammscrete for more info on a specific fairing coat. These are flowable micro concretes used to repair and replace larger sections of damaged concrete. Designed for pour and pump applications the material is poured into shuttering to reform concrete profiles. These systems are pourable and pumpable and exhibit low exotherm, low alkali content, high strength and shrinkage compensation properties. An example of this is EUCO MC, which is a flowable micro concrete for shutter and pour applications that has extremely good flow and flow retention in order to overcome congested steel configurations. For fast track repairs, EUCO PQ is recommended. This product will give fast setting and rapid strength development for thicknesses of 12mm – 150mm (typically 30N/mm² @ 1 day). A section of this floor has been repaired with EUCO PQ. Overlayments are systems designed to resurface or give added protection to an external or internal floor. These products give higher abrasion resistance and give a consistent level profile. The polymer modified cementitious topping EUCO TT can be used for internal and external surfaces with surface irregularities that need eliminating and smoothing out. This system can be pumped up to 1,000 m2 per day and is great for surfaces exposed to industrial traffic. Dry Process: Dry material pneumatically conveyed to the water injection nozzle. Wet Process: Fluid material pumped to the air injection nozzle. Robotics: stand-alone nozzle manipulators or fully integrated pump and nozzle units. Latex modified, one-component shotcrete materials are useful in situations that call for sprayed concrete to fix large repairs. Cement based, modified mortars (such as EUCOSHOT and EUCO Diamond Shot) are available that have been specifically designed for use on vertical and overhead surfaces by dry shotcrete application or by mixing with water and applying as a wet-mix shotcrete. As the saying goes, prevention is better than a cure. Specialist coatings are available that have been designed to protect good quality concrete from failing in the future. These coatings create a barrier between the concrete and the outside elements that helps to stop the main forms of corrosion from occurring. 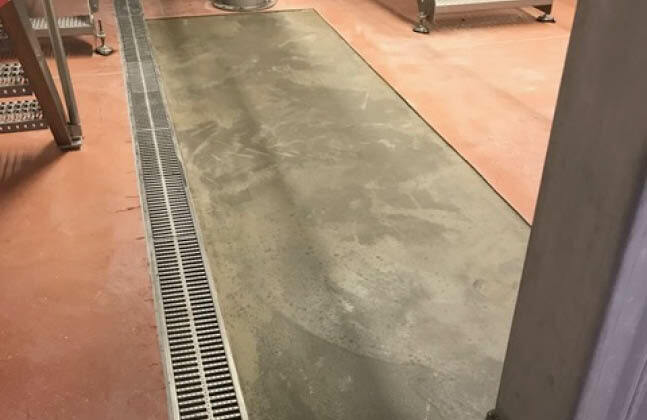 High build, water-based acrylic systems (such as Tammscoat) are available that will repel water and protect from carbonation while providing a breathable and highly durable outer layer for the concrete’s exterior. A protecting coating will help keep concrete looking its best. As you can see there are a lot of different options out there! If you’re having trouble identifying the right solution for you, drop us a message and we’ll help you out. I didn’t there were so many different ways to repair concrete. Thanks for the guidance on the many different options out there. I will have to do some more research and see what I like better.